Amazon announced last week that it will increase the minimum wage for its US and UK employees starting next month. The tech giant said it would phase out its restricted stock unit program and variable compensations. Certain Amazon employees will actually “lose out” after the new wage change, Nomura Instinet said. Amazon announced last week that it is raising minimum wage for US and UK employees, but Nomura Instinet analysts say the pay hike comes at a cost. 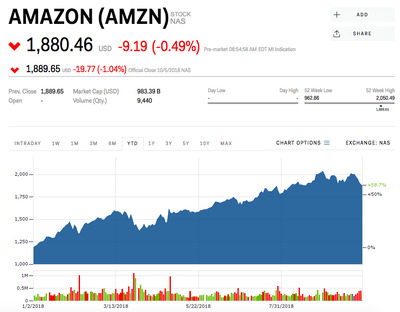 “This was not all roses as Amazon is eliminating restricted stock options and monthly incentive bonuses for hourly employees,” a team of Instinet analysts led by Simeon Siegel said in a note sent out to clients on Monday. Siegel noted that, prior to the hike, Amazon’s US fulfillment center employees earned an average hourly wage more than $US15 when including stock and incentive bonus. And so, these employees will actually “lose out” after the new wage change. Last week the tech giant said that, starting from November 1, it will lift its US minimum hourly wage to $US15 per hour and its UK minimum wage to £10.50 ($US13.60) for the London area and £9.50 ($US12.36) for the rest of the UK. The decision follows sustained pressure from Sen. Bernie Sanders, who attacked Amazon for the amount it pays its workers. By Siegel’s calculation, the wage increase – spanning full-time, part-time, temporary, and temporary agency employees in the US and UK- could drive $US1.3 billion to $US2.7 billion of incremental expenses. But the plan to phase its restricted stock units and variable compensations could save Amazon $US900 million. Therefore, after excluding savings by eliminating benefits, Amazon could see a net cost of $US400 million-$US1.9 billion, suggesting only 15-70 basis point of deleverage, Siegel said. Siegel has a “buy” rating and $US1,990 price target for Amazon. Amazon shares have lost 5% since the wage hike announcement, but are up 59% this year through Friday.